This past weekend brought another blast of winter to Alberta. Rather than stay at home, off we went into the west country to check to see how the wild horses were surviving this “never ending story”. This time of year it is difficult to travel a lot of the roads in the back country because of melting snow and mud. We decided to stick to main roads as we searched out some of the herds of wild horses that we know about. The whole day the skies were cloudy and thick with snowflakes. This caused the finding of the horses to be a bit challenging, as they tended to seek cover from the cold wet wind. Undaunted on we went. 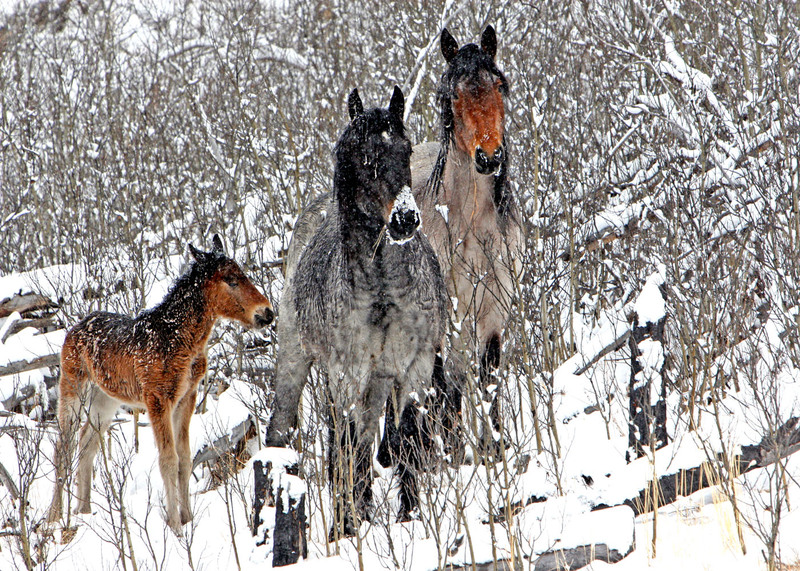 In the wild horse herds many of the mares are heavy in foal and with this unseasonable weather there is a fear that many of the foals may not survive if they were to be born now. 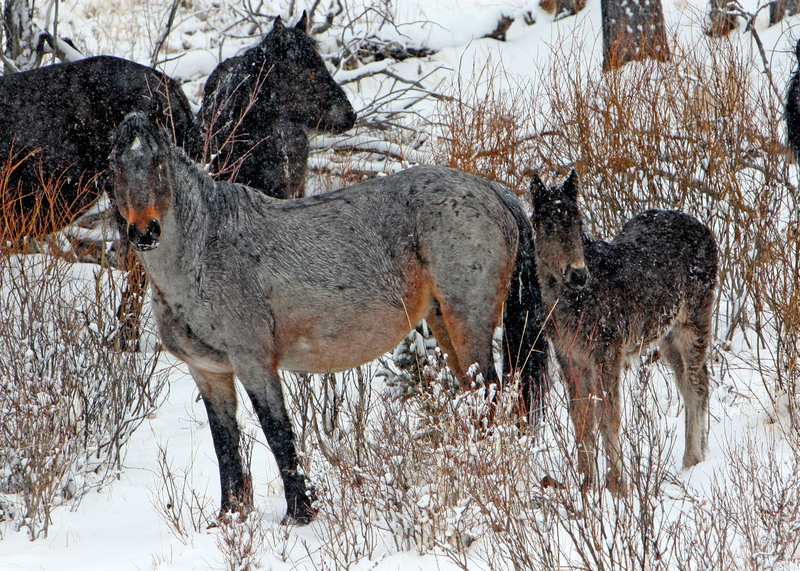 The roan mare in the above picture, as you can see, is close to term. 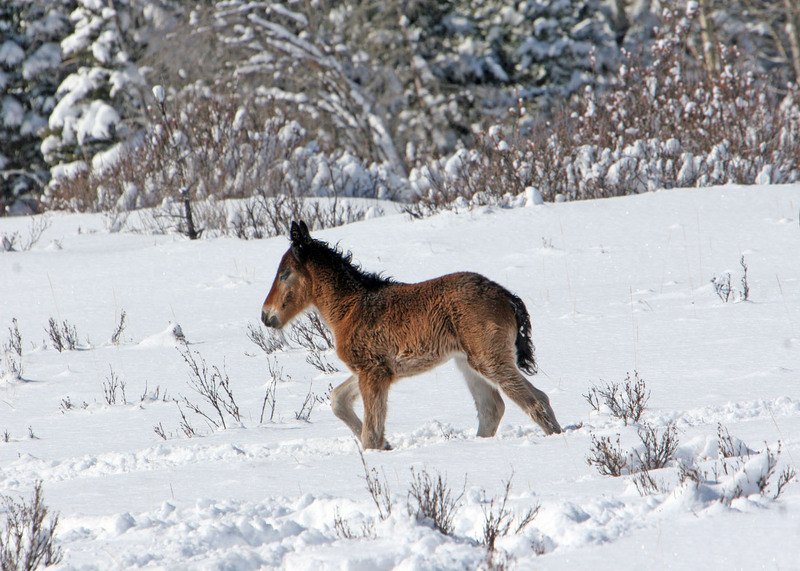 We only hope that Mother Nature warms up soon for the newborns. As we travelled and came across the different herds, it was nice to see how they all appeared still to be so healthy. 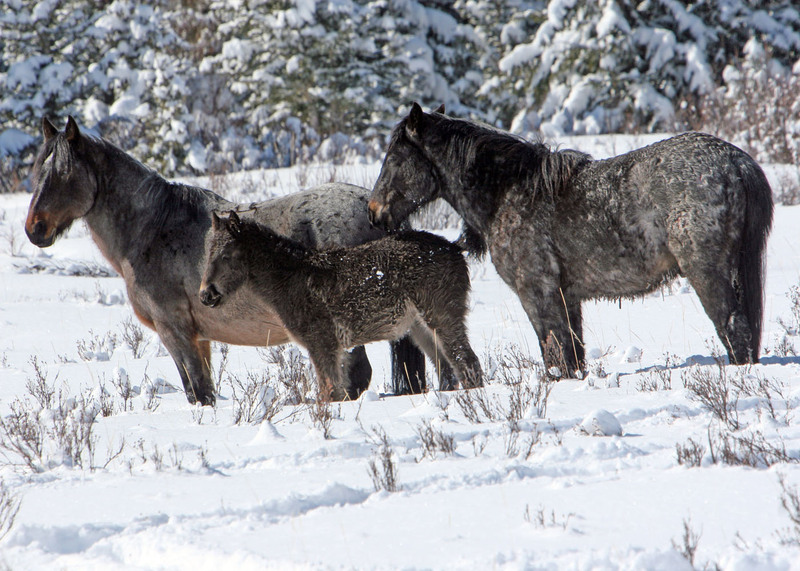 Deciding to check on the Wild Horse Creek herd of Raven’s and the two foals that we named Yepa and Snowstorm, we headed toward where we hoped to find them. Sure enough around the bend, there they were shrouded by a fog and heavy falling snow. Yepa is growing rapidly and is very strong considering she was born in January. It was fun to see her actually lead the herd off at the end of our visit with them. We were especially concerned about Snowstorm who is only a month old. But there she was in the middle of the herd, back arched to the cold but looking fine. What a relief and what a beauty! 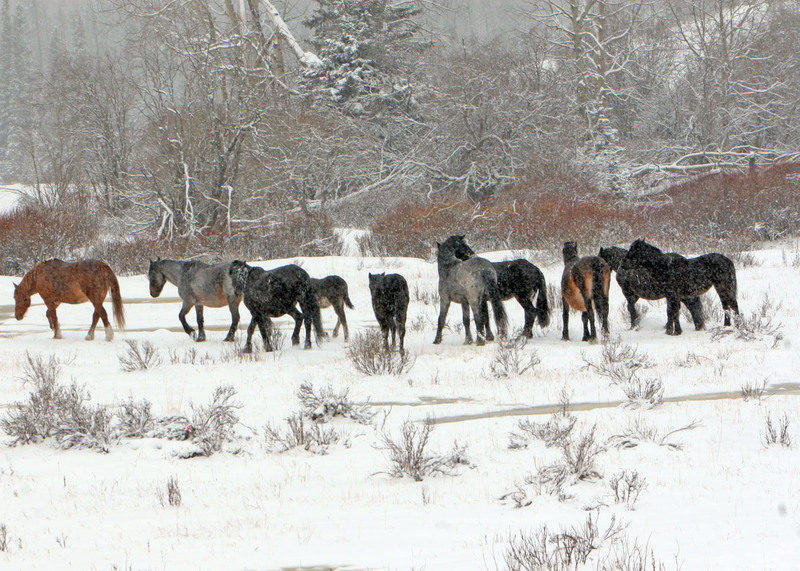 The herd seems surprisingly unperturbed by the deepening April snow. 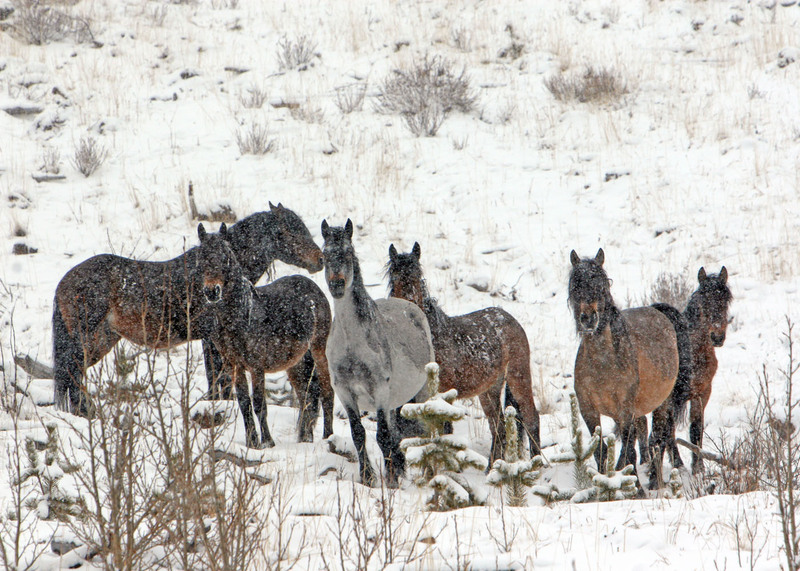 The younger horses were galloping and playing about, oblivious to the snowstorm we were in. Even young Snowstorm manages to make her way through the snow which is sometimes up to her belly. These are amazing animals who continually prove that they are adapted to this their natural environment. They do deserve to be here roaming free and wild. Raven, the magnificent black stallion of this herd, is an amazing animal. Undaunted by the challenges, he carefully watches over his herd. It is quite enlightening to watch how gentle he is around the two foals who seem to be drawn to him and follow him about. No wonder I’m in love with these wild horses! After visiting Raven’s herd, on we went to see the other wonders that this country, even in spring snowstorms, has to offer. We came across other herds of horses and even a large herd of elk on a hillside. Most of the herds we found seemed oblivious to our presence, for as we came across them they were more interested in foraging for feed than us. Covered with ice and snow they continually pawed or pushed their noses through the snow to find the succulent grasses buried beneath. 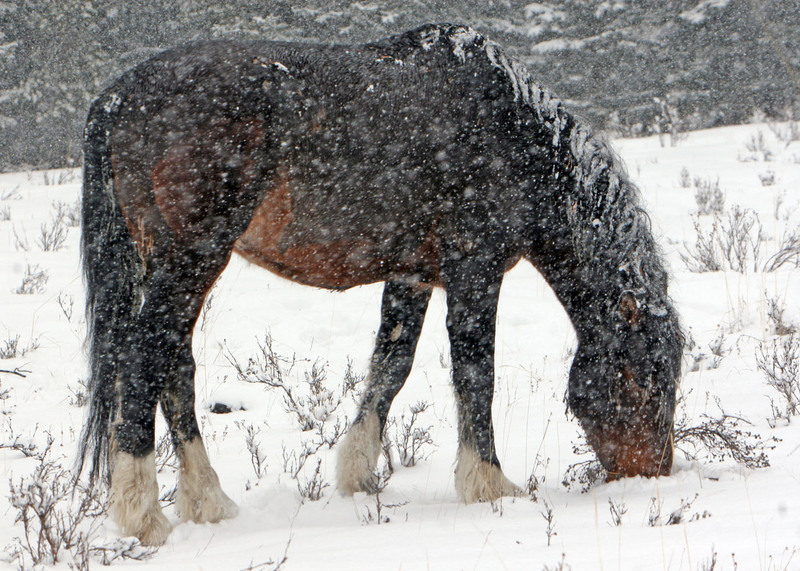 As the snow increased, we decided to call it a day and leave the horses in peace. We’ll definitely be out there again next week to visit them and to check on those mares that we know are so close to foaling.